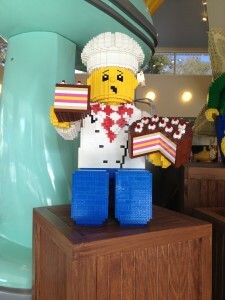 Baking some quality blogging topics this summer is a piece of (Lego) cake! It’s so easy to lose your blogging momentum during the summer, even if you have an editorial calendar and update it at least once a week. I understand and commiserate with you. I’m not infallible to the temptations of summer sun, sand, and souvenirs! Cast Your Eyeballs on a (Remote) Competitor’s Blog to Reel in Topics: You don’t need to bookmark too many competitors’ websites to accomplish this not-at-all-unethical snooping mission. The key is to scan articles and glean topics that you can borrow from and then translate into your own voice. But don’t let the summer heat melt too many of your neurotransmitters–plagiarism is not an option. I’m begging you not to do it. So just DON’T do it! Associate Yourself With the Finest Associations in Your Industry: No matter your profession, there’s an app(licable) trade association or organization for that. Seriously now, if you Google your industry or profession, multiple websites chock-full of dense content (association blogs, press releases, white papers, industry research, etc.) are bound to populate the first page of your SERPs. Search for the Trade Publication of Your Dreams (Then Borrow Liberally): Similar to tapping into your industry’s professional associations and organizations, it’s just as easy to search for online versions of trade magazines. These publications should be loaded with headlines and articles regarding current news and trends people in your profession can absorb and share with others. The “lamestream media” approach (thank you, Sarah Palin and others) will guide you toward mainstream magazines (all the links are here via one source!). The usual suspects are Forbes, Inc., Fast Company, Entrepreneur, and the Harvard Business Review. More eclectic and rebellious publications to peruse for potential expansion of your blogging palette include: Upstart Business Journal, Rebel Times, Corporate Heelz, Impressive Magazine, and Relevant Magazine. When Your Brain Is Firing on No Cylinders, Aggregate Your Blog-Post Brainstorming: As we move further into August, it’s easy to slip into a content-induced coma. All you really want to do is go outside and play (or swim, or fly, or…). But don’t reach for another Starbucks coffee drink your bloodstream doesn’t need, or something even worse (like Red Bull). Feeling better, my frantic and worried blogging buddies, now that you have a few more virtual aces up your individual sleeves? Have you already tried some of the resources I mentioned (as possible antidotes for your topic-generating woes)? If so, which would you recommend to my readers, and which would you deem as pabulum? Fear not, business (and other) friends–Labor Day (and all that it implies) is only less than three weeks away. In the meantime, go forth and blog with confidence!